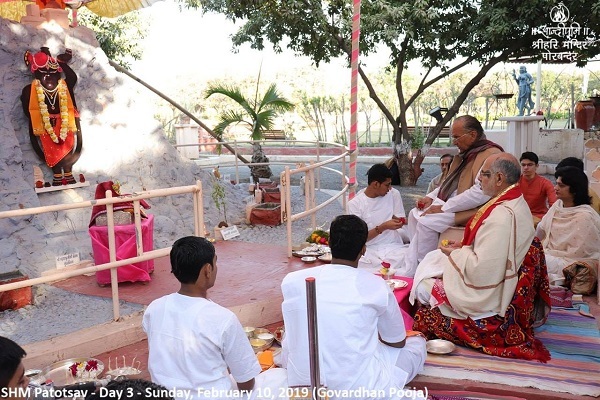 On day 3, Shri Hari Mandir Patotsav celebrations continue with pooja and worship of deities, medical camps, lectures by Sandipani scholars, cultural programmes and discourse on Gitaji. 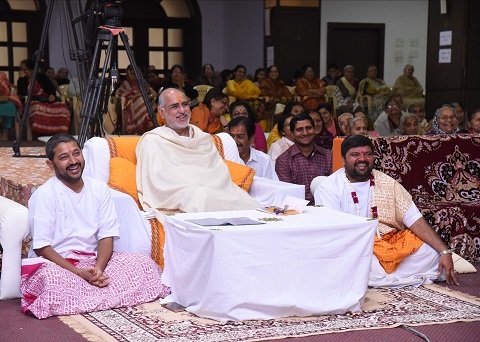 On day 3, Swami Anubhavanand Saraswatiji based his discourse on the sixth chapter of Gitaji. As this chapter contains philosophical depth, Pujya Swamiji presented it in a simple but humorous manner. Swamiji said that sorrows and happiness come in life due to duel. These duels of happiness and sorrow, rise and downfall, winning and losing, praise and insult will continue. 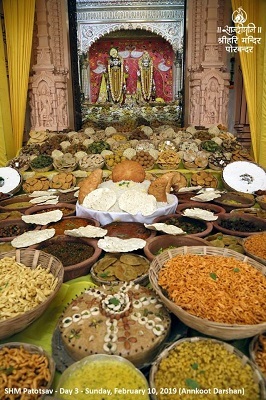 However, those who can maintain a balance in these situations should be considered to have attained God by 50%. Pujya Swamiji said that praise and insults have been created by us. One who remains in bliss continuously can also remain in devotion and such a person will never harm anyone. Swamiji enlightened all that the reason the word ‘Ānand‘ is added to the name of ascetics is because they wish to remain indiscriminative all the time. 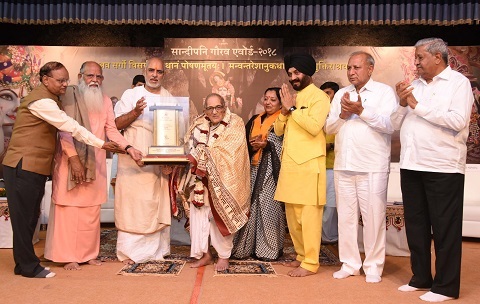 Sandipani Gaurav Awards were held on the afternoon of 10th February 2019. 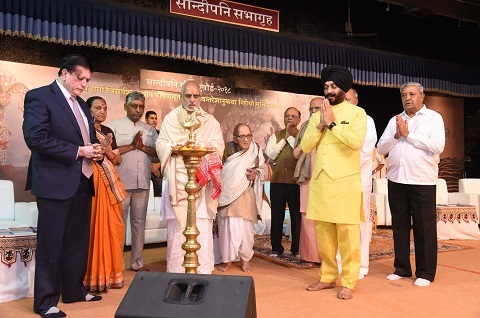 The event commenced with kindling of the auspicious lamp followed by welcome speeches by Bhagyesh Jha and the retired Cabinet Minister, Shri Babubhai Bokhiriya. 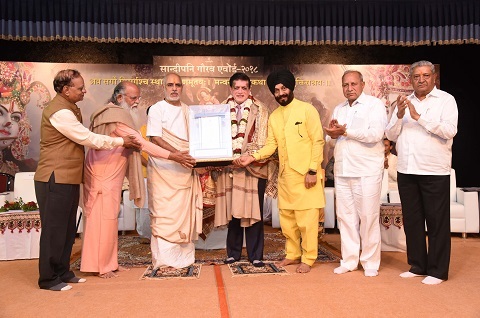 The Chief Guest of the event was Shri Maninderjeet Singh Bitta, chairman of the All-India Antiterrorist Font who expressed how blessed he felt to be able to be in the company of Pujya Bhaishri today. This was presented to Bhramalin (late) Narayan Devacharyaji Maharaj of Jaipur. 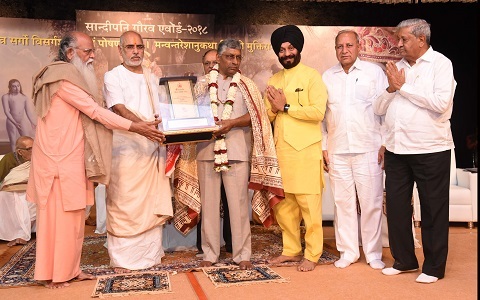 The award was accepted on his behalf by Shri Hajra Saheb. This was presented to Dr. Satyavati Shastriji from New Delhi. His daughter, lnduben was also present on the occasion pf reveiving the award. Dr. Satyavat Shastriji in his speech addressed the youth and advised them not to be satisfied when gaining knowledge nor to sit with content having worked unsatisfactorily. This was presented to Dr. Kiranbhai Patel from USA. Dr. Patel explained in his speech that a person can earn wealth and know its value but only God can provide one with time. Thus a person who gives one’s time is invaluable. This was presented to the managing trustee of ‘Sahyog kushtaroga Trust’ in Himmatnagar, Dr. Sureshbhai Soni and his wife Mrs. Indiraben Soni. The award was accepted by Mrs. Soni and their son Dipakbhai Soni. Mr. Soni has a vow not to leave his work in which he is establishing hospitals and groups to treat leprosy and looking after the weak- minded children. He is also planning to open an old people’s home for those less able. 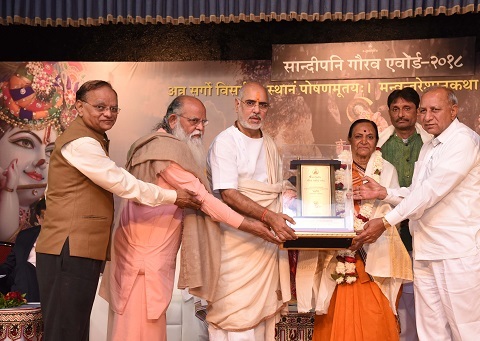 Pujya Bhaishri recalled that these awards have been running since 1996 and congratulated all the awardees. He said that Devarshi is related to truth and action, Bhramarshi symbolises consciousness which in turn is related to knowledge, Rajarshi is related to bliss and devotion and a Maharshi is one spreads as well as shares knowledge with compassion to all. Pujya Bhaishri expressed his happiness on the 25 institutions from Porbandar who have joined today to present these awards. 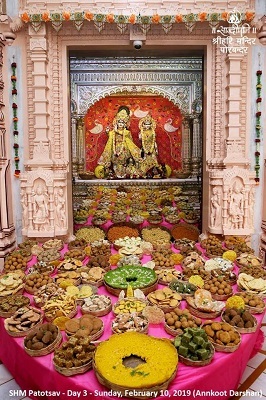 On day 3, Shiri Govardhan pooja was performed by Pujya Bhaishri and devotees present. 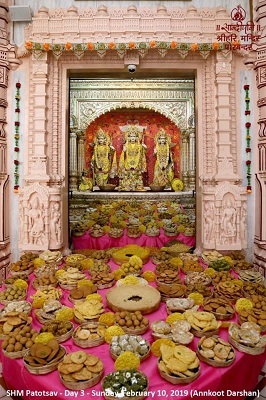 This was followed by the offering of Annakut (variety of food) to the deities in Shri Hari Mandir.